Rapid Building Solutions (RBS) provides professional solutions to unique storage building needs for both residential and commercial clients. Since their founding, Rapid Building Solutions has become the leading authority in innovative design and construction for the storage industry. 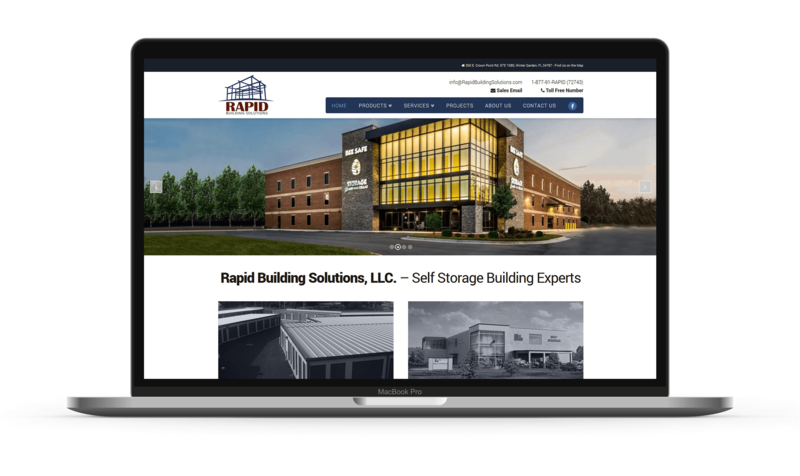 As a trusted partner in the self-storage industry, Rapid Building Solutions needed to create an amazing online presence that would match up with their brand name. While the company provides various solutions for self-storage needs, the real value that they provide is the full-spectrum of services to help their customers reach their goals. This meant that they needed a professional with the experience and knowledge to help them build an effective Internet marketing strategy. Increased conversions pave the way for a growing business. Scale your business to success with proven website SEO copywriting! The self-storage building industry is a crowded space, so RBS wanted to have an amazing online brand that stands out from their competition. We worked with the leadership at RBS to identify their target audience, and craft engaging content that would not only answer the questions of their readers but also drive qualified traffic to their website. Rapid Building Solutions is a leading authority in the personal storage industry. As the personal storage market grows, Rapid Building Solutions continues to help their clients with consultation, engineering, and construction of their projects. Due to the range of services offered by Rapid Building Solutions, we knew their online presence needed the best SEO copywriting services available. Competition is fierce in the personal storage market, and Rapid Building Solutions was looking for the best freelance copywriter to help them accomplish their online marketing strategy. They needed to get found quickly in search engines, convey a concise message for their audience, and then convert their readers into paying customers as soon as possible. Since Rapid Building Solutions offers a range of services for the commercial and residential markets, we spearheaded market and customer research to ensure their website content addressed the needs of each reader. The website content that we produced was specialized for both markets and helped show the benefits of choosing Rapid Building Solutions over their competition. We worked with the leadership at Rapid Building Solutions to develop content for their readers and marketing on search engines. Our freelance copywriting services helped Rapid Building Solutions represent their brand and appeal to their customers. Pixelchefs took the lead on this project, and we were brought onboard to craft awesome content that converts their readers to paying customers. Together with PixelChefs, we provided vital insight to design the online presence for Rapid Building Solutions around their business goals, and our professional copywriting services were put to use as we drove qualified traffic through search engines and other inbound marketing techniques. We helped lead the entire process from concept and planning of compelling website content for this industry-leading company. As a result of our professional insights, Rapid Building Solutions has seen a significant increase in qualified website traffic and their annual revenue is already on the rise compared to last year. Rapid Building Solutions is passionate about delivering the best personal storage solutions for their customers and their business has expanded quickly over the past five years. While their business grew, their online presence was weak and preventing them from reaching their business goals. Instead of settling for amateur marketers, Rapid Building Solutions chose to invest in a professional freelance copywriter who knew how to write great content and optimize for search engines. The online marketing strategy that we created for Rapid Building Solutions was built on solid customer research and optimized to provide solutions to the needs of their readers. Along with great content for search engines, the website copywriting project we delivered was focused to speak to the readers and boost online sales. 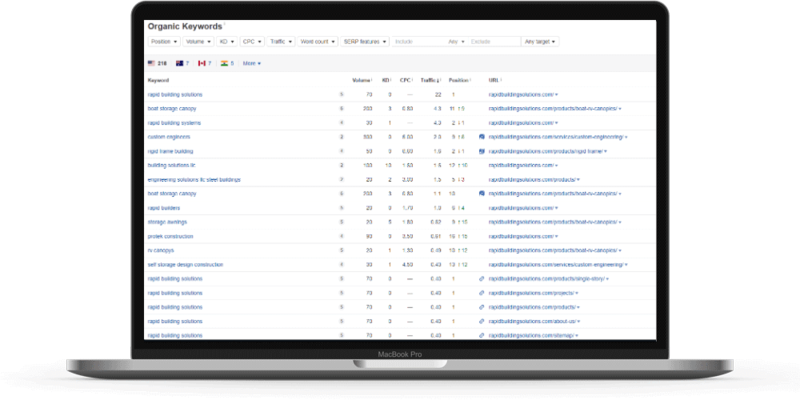 We follow a strict methodology to find your target audience and build content that ranks and helps you make more sales! Chris delivered professional content for a recent digital marketing project, and he delivered on time and within budget. Chris is a passionate and knowledge marketer who cares about his clients and gets results! Chris has helped our businesses with PPC, SEO, and content development. He is a master of digital strategy with superb customer service skills. Chris always puts the success of his clients first. We couldn't be happier using him for digital marketing. Chris brings an unparalleled attitude and enthusiasm that translates into how he communicates & writes, and that has really helped my business serve my clients better.